Aerobic exercise produces antidepressant effects comparable to those of psychotherapy,4–6,11 including cognitive-behavioral therapy.6 Treatment completion rates are higher in aerobic exercise interventions than psychotherapy.6 No published studies have compared anaerobic exercise to psychotherapy for depression. Aerobic exercise produces comparable antidepressant effects to pharmacotherapy for mild-moderate depression (eg, Beck Depression Inventory scores between 14 and 28),5,6 and treatment completion rates for exercise treatment and pharmacotherapy are similar.6 Aerobic exercise may have a more favorable side-effect profile compared to pharmacotherapies.6 No studies to date have compared anaerobic exercise to pharmacotherapy for depression. Interventions are typically implemented indoors (fitness centers, research laboratories), which is ideal for resistance training and treadmill training because indoor facilities contain specialty fitness equipment. However, these settings can introduce barriers that can undermine exercise for some patients (eg, transportation, social anxiety). Indoor or outdoor walking may be more accessible and feasible for some people. In terms of exercise format, group exercise can increase social support and adherence, whereas individual exercise can be more flexible and feasible for some patients. In the absence of strong consistent evidence of a superior exercise type,12,15 the prescribed exercise type, modality, format, and location may be best determined based on a patient's preference, with the goal of maximizing exercise enjoyment and adherence. The intensity of the exercise interventions for depression ranges widely. For aerobic exercise, prescribed intensity can range from “comfortable pace,” moderate intensity (50%–70% maximum heart rate), to vigorous intensity (eg, 70%–85% maximum heart rate);12 the most common intensity is 60% to 80% maximum heart rate.12 For anaerobic exercise, the prescribed intensity can range from 50% to 70% of maximum heart rate.12 Although antidepressant effects result from any level of exercise intensity, some evidence suggests that interventions using higher intensity produce larger effects;6,7 although vigorous-intensity exercise relative to moderate-intensity may produce more negative affect in response to exercise that could undermine the mood-enhancing effects of exercise. Symptoms of depression (anhedonia, amotivation, fatigue) may interfere with adoption and maintenance of an exercise program; people who are depressed may also have poor problem-solving abilities to manage emergent barriers. Thus, people with depression may benefit from learning cognitive-behavioral skills with exercise programs (eg, challenging negative thoughts about exercise, goal setting, problem-solving strategies) to address depression-specific barriers to engaging in exercise.18 Example exercise prescriptions are presented in Table 1. We also include a prescription recommendation based on the evidence for the mood-enhancing effects of lifestyle physical activity (LPA), which stresses the integration of brief bouts of activity into the context of daily living.17 LPA intervention can be a good fit for inactive people with depression who may find it less overwhelming to engage in brief bouts of activity within their daily life, relative to structured exercise. Given the sensitivity of the behavioral activation system and risk for mania,20,22 there is some concern that exercise could be overly activating for patients with BP, leading to new onset or exacerbation of hypomanic symptoms. Some patients report excessive exercise during hypomanic states,20 which may lead to acceleration of activation and maintenance of mood symptoms; the risk of potential physical injury may also increase. Moreover, heat sensitivity is associated with the use of lithium and other mood-stabilizing agents.23 It is important to monitor the setting, intensity, and time of day to limit risk of heat-related side effects of pharmacotherapy for BD. Until more data are available on exercise in BD, exercise prescriptions should be personalized, flexible, closely supervised, and modified based on patients' current mood state.22 Ensuring that exercise occurs on a consistent schedule may also promote the circadian and social rhythm regularity that is associated with mood stabilization in BP.24 Future research is necessary to determine the efficacy of exercise in BP and to refine exercise recommendations. Several randomized controlled trials indicate that postpartum exercise has superior antidepressant effects relative to a control intervention,27 although low adherence may attenuate intervention effects. Exercise during pregnancy also appears to lower the risk of postpartum depression.28 Studies of perinatal exercise interventions used varied exercise formats, including group or individual walking programs, gym-based fitness programs involving cardiovascular and/or resistance training, and home-based programs that use a range of physical activities based on women's interests. Further research is needed to clarify the efficacy of exercise as an intervention for depression during pregnancy and postpartum, as well as optimal intervention format. Depression is often comorbid with chronic pain. Although patients may cite chronic pain as a reason why they cannot exercise, exercise is recommended in many chronic pain conditions, such as chronic low back pain29 and osteoarthritis.30 In fact, exercise may serve to improve pain-related outcomes in addition to conferring other mental and physical health benefits.29,30 Many patients with pain have a fear of movement or a fear of increasing pain, possibly because of the patient's belief that pain signals more “damage” to an existing injury or pain site. Thus, it may be difficult for these patients to initiate a new exercise program. Clinicians can help patients to overcome fears by providing education about chronic pain including the fact that research has shown that exercise is indicated or at least not harmful for their pain condition. Patients may start with low intensity, short-duration exercise training, and then slowly but steadily increase the intensity/duration over time. 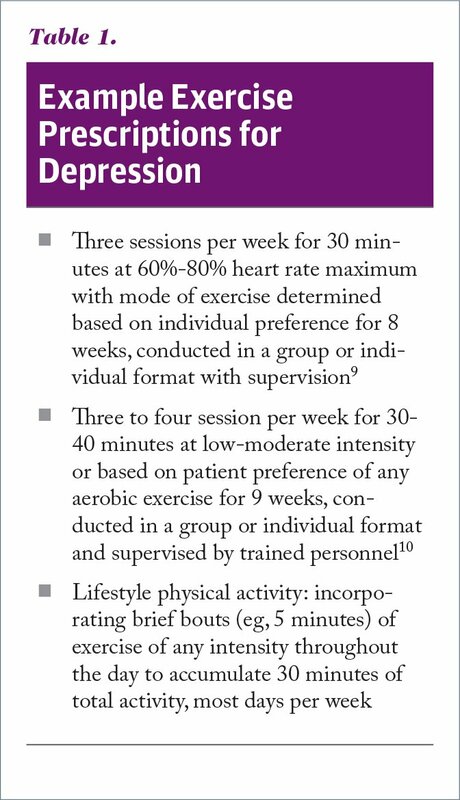 The incidence of adverse events from exercise interventions in depression is low.6 Although the absolute risk is low, vigorous-intensity exercise may increase the relative risk of sudden cardiac death or acute myocardial infarction in some people.33 This is balanced with the cardio-protective effects of a sustained exercise program. The American College of Sports Medicine provides guidelines for who should receive medical clearance prior to engaging in a new exercise program.33 Healthy people with no cardiovascular, metabolic, or renal disease, and no symptoms suggestive of these diseases may engage in exercise without medical clearance. People with known disease may require medical clearance, depending on whether they are currently symptomatic and based on current activity levels. Perinatal women without complications are encouraged to exercise regularly but should consult with providers prior to initiating a new exercise regimen. People with severe depression should prioritize standard depression treatment prior to engaging in an exercise program. Those with mild to moderate depression enrolled in exercise programs would benefit from monitoring by mental health providers to address any clinical deterioration. A less severe risk of exercise is musculoskeletal injury, which is lower risk in lower-intensity exercise and with appropriate warm-up, cool-down, and increasing intensity gradually. Growing literature documents the efficacy of exercise in the treatment of depression, as a stand-alone or adjunctive treatment. More research is needed to establish the efficacy of exercise for treating depression in certain subpopulations as well as the optimal format of exercise interventions. National Collaborating Centre for Mental Health (UK). Depression: The Treatment and Management of Depression in Adults (Updated Edition). Leicester, UK: British Psychological Society; 2010. Cooney GM, Dwan K, Greig CA, et al. Exercise for depression. Cochrane Database Syst Rev. 2013;(9):CD004366. doi:10.1002/14651858.CD004366.pub6 [CrossRef]. Perraton LG, Kumar S, Machotka Z. Exercise parameters in the treatment of clinical depression: a systematic review of randomized controlled trials. J Eval Clin Pract. 2010;16(3):597–604. doi:10.1111/j.1365-2753.2009.01188.x [CrossRef]. Otto MW, Smits JAJ. Exercise for Mood and Anxiety: Proven Strategies for Overcoming Depression and Enhancing Well-Being. New York, NY: Oxford University Press; 2011. Abrantes AM, Matsko S, Wolfe J, Brown RA. Physical activity and alcohol and drug use disorders. In: Ekkekakis P, ed. The Routledge Handbook of Physical Activity and Mental Health. New York, NY: Routledge, Taylor & Francis Group; 2013:465–477. Samantha G. Farris, PhD, is an Assistant Professor, Department of Psychology, Rutgers University. Ana M. Abrantes, PhD, is a Professor, Department of Psychiatry and Human Behavior, The Warren Alpert Medical School of Brown University. Lisa A. Uebelacker, PhD, is an Associate Professor, Department of Psychiatry and Human Behavior, The Warren Alpert Medical School of Brown University. Lauren M. Weinstock, PhD, is an Associate Professor, Department of Psychiatry and Human Behavior, The Warren Alpert Medical School of Brown University. Cynthia L. Battle, PhD, is an Associate Professor, Department of Psychiatry and Human Behavior, The Warren Alpert Medical School of Brown University. Address correspondence to Samantha G. Farris, PhD, Department of Psychology, Rutgers University, 53 Avenue East, Piscataway, NJ 08854; email: samantha.farris@rutgers.edu. Disclosure: Lisa A. Uebelacker discloses that her spouse receives a salary from Abbvie Pharmacueticals. The remaining authors have no relevant financial relationships to disclose.